Anyone whose seen a Milo Yiannopoulos lecture knows that its the protestors that are often the highlight of the night. Milo’s responses often give the impression that he’s had a hundred years to think of whatever comeback he spits back at them. With the exception of a talk at DePaul University, the protestors usually left after being embarrassed, but just the other day, they succeeded in de-platforming him for the first time. 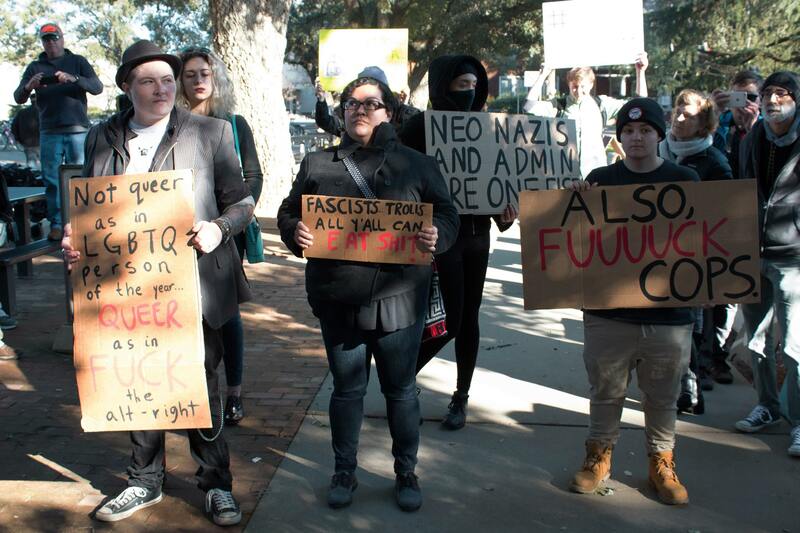 On January, Friday the 13th, an event hosted by the UC Davis College Republicans featuring far-right provocateur Milo Yiannopoulos and pharmaceutical CEO Martin Shkreli was cancelled after violent protests emerged on campus. Frances Wang, ABC reporter, covered the protest lives and even featured video content on her Twitter, showing protesters chanting “No Milo, no KKK, no fascist U-S-A” and “No justice, no peace. No racist police.” Signs featuring the slogan “Hate speech=free speech” were shown, despite the fact there is no constitutionally recognized exception to the First Amendment. Unfortunately, her photojournalist had hot coffee poured on them trying to cover the protest. Additionally disturbing; Mindy Romero, Director of the California Civic Engagement Project at UC Davis, tweeted in celebration after the event was forced to be cancelled by protesters. Although given the National Association of Scholars criticism of modern university civics education as a form of progressive political activism as opposed to teaching civics from a politically neutral perspective, this may not be surprising. Milo often speaks about the disastrous effects the far-left of today is having on free speech, and campus protesters shutting him down are merely proving him right. When Milo speaks out against the Regressive Left or “Social Justice Warriors,” his events getting cancelled by protesters or irate feminists pulling fire alarms only serve to make him stronger, leading to more media coverage, and thanks to his recent book deal, more book sales. Ironically, in trying to shut down his speech, intolerant protesters are giving him more of an audience. Sadly, this wasn’t an isolated incident. These past years have seen a surge in protesters shutting down or attempting to shut down speakers they don’t like, including Yale University students shouting at a professor for speaking out against the infantilization of students during the Halloween costume controversy, protesters shutting down an event at California University where Ben Shapiro was set to defend freedom of speech, or the immature behavior of protesters at an event called “The Triggering: Has Political Correctness Gone Too Far” featuring Steven Crowder, Milo Yiannopoulos, and Professor Christina Hoff Sommers, where Steven Crowder’s rant against “Social Justice Warriors” went viral. Not to mention the slew of campus commencement disinvitations, which hit a record in 2016. The Foundation for Individual Rights in Education (FIRE) has aptly deemed this “disinvitation season”. For the record, I disagree with Milo Yiannopoulos, Ben Shapiro, and Steven Crowder on a variety of topics, but I fully support their freedom to speak on college campuses, and those who wish to listen to their message to be safe from violence and harassment. Those who disagree with them will be better served engaging them in the battlefield of ideas or ignoring them entirely.